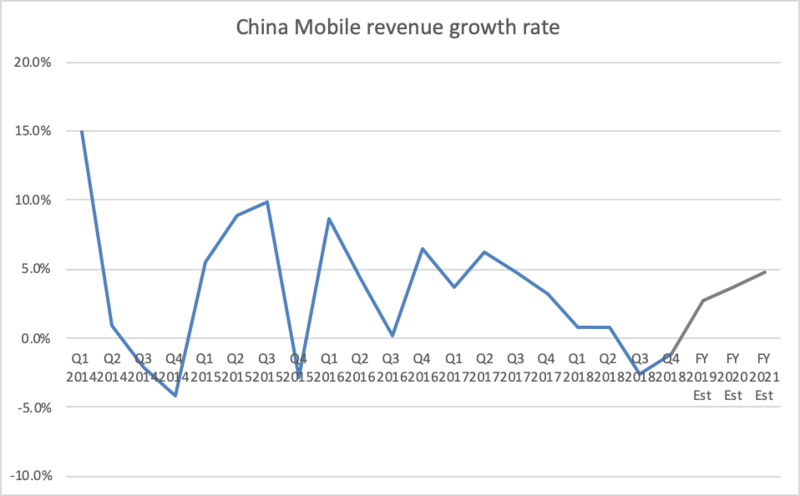 China Mobile beat on net profit by 2%. Total revenue missed by 1% on lower mobile service revenue. Mobile ARPU expected to continue to decline, but data traffic is increasing very quickly. 5G capex is limited but not expected to grow too fast in 2020-21. Attractive defensive play for 4G/5G upgrade at 4% dividend yield. 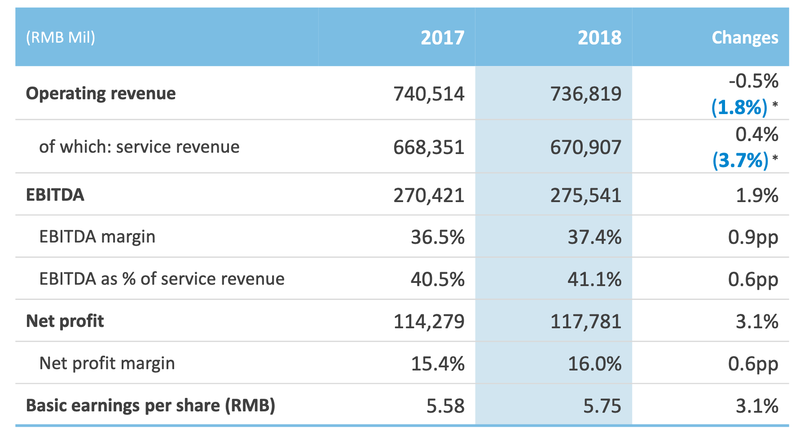 China Mobile (CHL) net profit for FY2018 was RMB117.8bn, beating estimates by 2%. 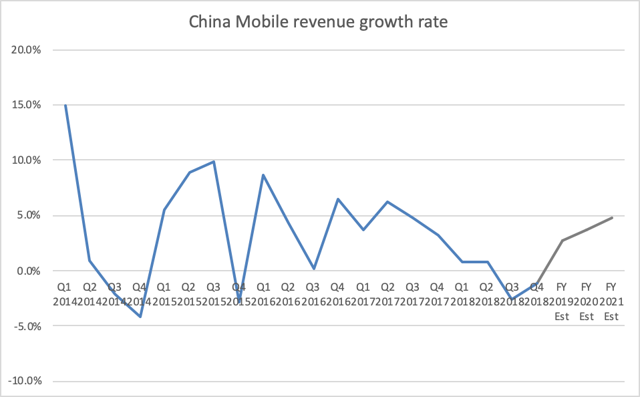 But total revenue of RMB671bn missed by 1% on lower ARPU and weaker 4Q mobile data revenue. Mobile service revenue fell ~4% in FY18, mostly attributable to 4Q, which was down 4.5% yoy. On the flip side, fixed broadband revenue grew to 8% of service revenue or 37% yoy. Revenue growth may re-ignite as 4G LTE/VoLTE coverage expands (currently covering 53% of mobile users), while 5G begins its initial rollout. Mobile service revenue continued to slow - it was down 4.5% yoy with ARPU down 8%, mainly due to loss of revenue from SMS/MMS/voice. Data traffic was up 182% yoy, while data revenue was up 6% yoy. They expect to add 45m net subscribers for 4G this year. But because of lower data tariffs and roaming fee cut, management expects ARPU to continue to decline in FY2019E albeit at a slower rate. Market share for mobile customer is ~60% and is the largest player in China. Fixed broadband makes up of 8% of total service revenue and was up 37% in FY2018. Household broadband APRU was up 3%, and the company expects stable to rising household broadband blended APRU in 2019. Corporate market revenue was strong, making up 11% of total service revenue. This was mostly due to fast growing IoT, cloud computing, and big data revenue, which grew 75% yoy to RMB4.2bn. China Mobile continues to target growing market share to over 40% in 2019. China Mobile expects 4G/5G to coexist for years to come as 5G will initially only support data and cover specific areas of focus only. 4G would still be needed to host voice. They guided total CAPEX to decline yoy, with non-5G capex to be RMB150bn or down 10% yoy. This implies 5G capex to be less than RMB17bn as FY18 capex was RMB167bn. It is likely that the company can re-use its existing 4G towers with 5G so that will keep a lid on capex ramp in the future. Peak 5G capex is expected 2020-21 and will only grow modestly, which reads through as negative for 5G supply chain but positive for China Mobile as FCF may increase. Because of uncertainty of future capex, the company guided for a flat payout ratio of 49% for 2019E. FCF dropped over 40% in FY2018, but it is one-off as the company decided to pay its smaller suppliers quicker to support them. This will even out in the coming year. With street estimates of EBITDA growth of 5% in FY2019E and 4% in FY2020E and high 30s EBITDA margin, the stock trades at its historical average of 3.3x forward EV/EBITDA or at a discount to industry average of 7x. Dividend yield is about 4%, and DPS is estimated to grow 4-5% in 2019 and 2020. It could potentially be higher once 5G capex gains certainty. I view CHL as a defensive play for 4G expansion and 5G upgrade story. It is growing its market share through its 4G network quality and smartphone supply. Fixed line and datacenter-related businesses should provide a stable earnings driver. Additional disclosure: Disclaimer: All research, figures, and interpretation are provided on a best effort basis only and may be subject to error. Any view, opinion, or analysis do not constitute as investment or trading advice, please do your own due diligence.